We know more about the surface of the moon than the depths of the ocean. That’s no surprise given the conditions there. And yet, an ever increasing number of sophisticated vehicles are making their way down to the ocean floor. 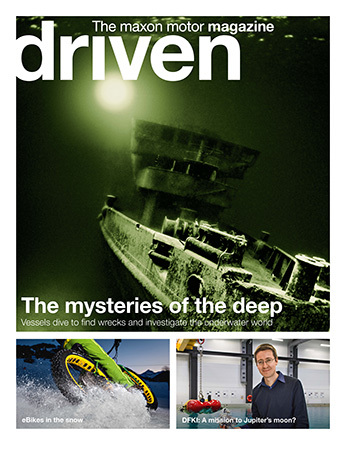 driven, the maxon motor magazine, also goes on a dive and brings back surprising facts and stories. Sophisticated robotic vehicles, autonomous or controlled via cables, are exploring the world underwater in search of scientific data, natural resources, or sunken shipwrecks. The technologies used must be able to resist aggressive salt water and huge ambient pressures. Learn more about how such systems are tested and where they are used: in the latest issue of driven – the maxon motor magazine. In the world of drives, the motor often takes center stage. However, a powerful motor controller is just as important. Our expert explains what capabilities a motor controller needs and what solutions maxon has to offer. We will also discuss a key question: DC or BLDC motors? Last not least, driven is looking at the latest developments in the field of exoskeletons that allow people with mobility impairments to walk again. driven is released twice a year as a print magazine in both German and English. It can be ordered free of charge. All back issues are also available in the tablet format in the App Store, on Google Play, and on Windows Apps.